Back to Bed is a very original freeware game for PC where players have to guide Bob the sleepwalker to the warmth and safety of his bed. Players control his subconscious protector Subob and navigate a dozen isometric levels filled with hazards and dangerous creatures. Gameplay is similar to the 1993 2D side scrolling game Sleepwalker for the Commodore Amiga, as some players may recall. 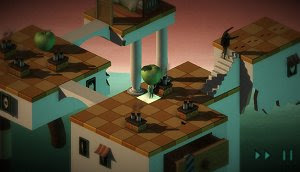 However, the isometric nature of Back to Bed makes for different strategies and the surreal visuals – that could be out of someone’s dream – guarantee that this is a game like no other.